Curious about the law? Do you have questions about the criminal justice system but don’t know who to turn to? Tune into our weekly radio show “Your Best Legal Defense” on VoiceAmerica.com/Variety from 11:00 a.m. until noon Pacific Time. “Your Best Legal Defense” is the show that’s here to answer your legal questions. 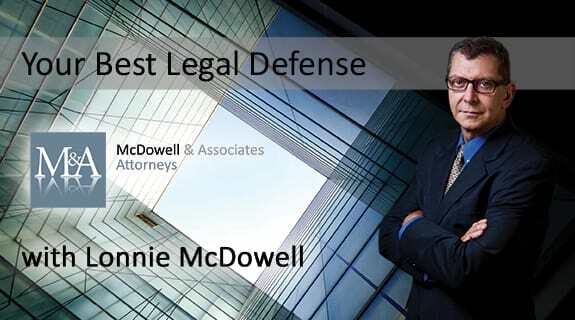 Hosted by Criminal Defense Attorney, Lonnie McDowell, our show will answer your questions about the criminal justice system, pressing criminal defense news, and recent court cases. Lonnie will also be taking questions from our listeners live on the show. Each week Lonnie will introduce guest hosts who have expertise in various fields within the criminal justice system and who can explain how it affects you and the ones you love. The show is designed to separate fact from fiction. You can’t protect your rights, if you don’t’ know your rights! * To ask Lonnie or his guest a question on the air, phone 866-475-5788866-475-5788 FREE during the live broadcast. ** Please note, this number is operational only during the live broadcast on Saturdays from 11:00 a.m. until noon Pacific Time. Missed an episode? Not to worry. You can find all our past shows in our show archives on this page, or on ITunes.